Tell me about Lazy K Ranch? In 1958 Mike Knapp registered the Lazy K brand with the state of California and started running cows in the Fresno area. In the fall of 1959, while attending Fresno State, Mike met a young "aggie" named Sherry. Mike knew from that day on, she would be his partner in their future cattle business. Sherry even owned her own cow named Bernadine but little did Mike know they would also end up in the horse business. According to Sherry, "Early on, we were having trouble finding good horses that could gather cattle off of 45,000 thousand acres at elevations up to 6,500 ft, so we started raising our own and one thing just led to another". Nearly 60 years later, Mike & Sherry along with their children and grandchildren are still running cattle in the San Joaquin Valley and Sierra Nevada Mountains as well as operating an extensive horse operation. Lazy K Ranch has become known for its unique pairing of good-minded, athletic working mares with the best ranch and performance horse bloodlines in the country. When you see a horse with a Lazy K on its hip, you know that horse can do an honest day's work and carries the bloodlines from some of the top money earners, including High Brow Cat, Shinning Spark, Peptoboonsmal, Kay Cee Leagure, Doc O Lena and Peppy San Badger. How did Lazy K Ranch's Annual Pick A Colt Day Production Sale get started? Unable to find a reliable source of quality horses for the stock operation, Sherry Knapp, the matriarch of Lazy K Ranch's horse program, purchased the ranch's first AQHA stallion and then searched the west coast for cow bred mares with good conformation to cross him on. Before long, word spread and friends and neighbors were asking if they could purchase horses right off the ranch. One thing lead to another and in 1982 Lazy K Ranch held its first annual Pick A Colt Day Production Sale. Is the Pick A Colt horse sale an auction? No, it is not an auction. Every horse is pre-priced so you know exactly what you are going to pay before the sale even starts. Why don't you just have an auction? This unique sale is better than an auction because you don't have to sit around and wait for hours for a particular horse to come into the ring, plus there will not be anyone outbidding you and raising the price. You know ahead of time exactly what the price will be. How does Pick A Colt Day work? Ranch Gates will open at 8:15 am. Upon arrival, guests will receive a Sales Catalog and then proceed to the Welcome Desk where they will sign a Liability Release Form. Prospective Buyers will be asked to present a photo ID with their date of birth, verifying they are 18 years of age or older. Each Buyer will then be given a colored wristband with their Buyer's Number on it. Buyer must be wearing this wristband to be eligible to pick a horse and sign a Buyer's Agreement. Each Buyer will also be given six (6) tickets with matching Buyer's Number printed on the back. Sherry Knapp will make introductions at 9:30 a.m. followed by a short demonstration by Larry Knapp showcasing some of the skills each yearlings is taught while attending Lazy K's signature ground school. Buyers will have access to the corrals at approximately 10:00 a.m. and have 20 minutes to view the horses for sale and make their selections. During this 20 minute viewing period, Buyers will deposit their tickets into jars attached to the pen of each horse they would like to purchase. Buyers may put all 6 tickets into one jar or select up to 6 horses with individual tickets. At approximately 10:20 a.m. a whistle will blow. Lazy K Representatives (each wearing a Red Shirt) will collect the ticket jars and assemble them, in groups of 6-8, at several "drawing stations" spaced evenly throughout the horse pens. Once all the jars are assembled, each of the Lazy K Reps at each drawing stations will concurrently draw a ticket from their lowest numbered jar and call out the Buyer's Number on the ticket. The Buyer must be immediately present with the corresponding wristband to be eligible to make the purchase. If a selected Buyer is present, the Lazy K Rep will hand the selected Buyer a Purchase Agreement. Once the Purchase Agreement is signed, the Lazy K Rep will give the Buyer the top copy of the Purchase Agreement and apply a sold sticker to the lot number on the horse pen. If the selected Buyer is not immediately present another ticket will be drawn. Tickets will continue to be drawn until a selected Buyer is present or until all the tickets are drawn from the jar. If the Lazy K Rep runs out of tickets before a selected Buyer is present, the horse will be available for purchase on a first come first serve basis, (no tickets necessary). When finished shopping, successful Buyers will then proceed to the Check Out Line to pay for their purchase(s). At approximately 11:00 am the online sales catalog will be updated to reflect horses that are still available for purchase. Online Buyers will then be able to add horses to their cart and complete the transaction using a Visa or MC. Please be advised that online sales are not final until the online transaction is completed and a receipt appears on your screen. Registering as an online Buyer prior to the start of the sale is highly recommended. At approximately 12:00 noon Lazy K staff members will start loading horses at a designated loading area. Buyers can either bring their own "yearling" size halter & rope or purchase the halter & rope that is already on the horse for $20.00. We strongly recommend you haul your yearling in a fully enclosed trailer and if using a "2 horse", remove the center divider. Can horses be purchased online? At approximately 11:00 am, you will be able to purchase any horses that are still available. Please note that pre-registering is strongly recommended. When is Pick A Colt Day? Pick A Colt Day takes place on the first Saturday in May. How many horses are generally offered at Lazy K Ranch's Pick A Colt Day? In the past few years we have averaged between 70 to 80 head. What are the ages of the horses offered? A majority of the horses offered at Pick A Colt Day will be 6-7 months old and quite growthy. There may also be some younger foals in the sale that can stay on the mare until they are old enough to wean. In addition to the weanlings and yearlings, we occasionally have two year olds, started two year olds, started three year olds, brood mares, brood mares with foals and/or bred back, and older kids horses for sale. All of the horses we raise are registered or are eligible to be named and registered by you. What are the breeds of horses offered? 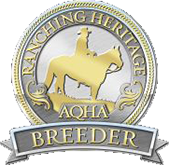 AQHA-American Quarter Horses, APHA-American Paint Horses. What types of Quarter Horses will be offered? Lazy K Ranch has become known for its unique pairing of good-minded, athletic working mares with the best ranch and performance horse bloodlines in the country, including High Brow Cat, Shinning Spark, Peptoboonsmal, Kay Cee Leagure, Doc O Lena and Peppy San Badger. What are some of the colors available? There is usually a little bit of everything. Browns, Blacks, Bays, Sorrels, Buckskins, Palominos, Blue Roans, Bay Roans, Red Roans and the occasional Grullo. Does Lazy K Ranch 5 panel test? Lazy K Ranch is taking a very proactive approach to genetic testing. Every horse offered for sale at the upcoming Pick A Colt Production Sale will have their 5 panel genetic evaluation clearly listed in the catalog description. What is a 5 panel test? The 5-panel is a test for five different genetic diseases found in quarter horses and other stock horse breeds. The panel includes testing for GBED (glycogen branching enzyme deficiency), HERDA (hereditary equine regional dermal asthenia), HYPP (hyperkalemic periodic paralysis), MH (malignant hyperthermia) and PSSM (polysaccharide storage myopathy). A few of our colts and fillies carry a recessive GBED gene which will not affect the health of the horse itself. GBED is only a problem if two horses carrying GBED are mated together, in which case there is a 50% chance of a still born foal. What kind of mares are these colts and fillies out of? Our mares are not only registered with the American Quarter Horse Association, when she is not raising a foal, Lazy K mares have a job. Whether in the show ring or ranch work in the San Joaquin Valley or gathering cattle from a mountain side in the High Sierras at elevations over 7,000ft, Lazy K mares work for a living. The kind of work that takes a level head, good legs and big heart. Then when you combine these traits with world class genetics, it is easy to see why Lazy K mares are more than just a pretty face. They are the legacy of a decades old breeding program that perpetuate horses with confidence, soundness, trainability and a superior disposition. Qualities they naturally pass on to their foals. How do you decide which mares and stallions should be bred together? First, only our best mares make it into our breeding program. We start by looking at the traits of each mare and then cross her on the stallion that best compliments her. We consider qualities like disposition, breedability, trainability and conformation (good legs & feet, good withers & back, small head, big eyes). 40 years of experience also helps. Can you send me a Sales Catalog? A preliminary online catalog is available in early March with photo and description updates in April. Printed catalogs will be available after the gates open at 8:15 a.m. on sale day but if you wish to have a catalog that includes photos, we recommend you print out the online catalog and bring it with you. Can I see prices before the sale? On Friday, the day before Pick A Colt Day, the exact price of each horse will be uploaded to our online catalog. To get an idea of the prices before then, click the Horses For Sale link and log into our Interactive Online Data Base. There you will be able to sort the sale horses by price range. (Please note this is based on a preliminary price and that the horse's final price may be in a different price range.) Last year's catalog is also available online which is a good representation of the prices you can expect this year. Can horses be previewed before Pick A Colt Day? In addition to our online catalog, participants attending the sale in person have an opportunity to view the horses that morning just prior to the start of the sale. We do not however allow horses to be pre-picked before the sale in order to keep it fair for the people traveling long distances. Printed catalogs are available at the sale but if you wish to have a catalog with pictures we suggest that you print out the online catalog and bring it with you. On Sale Day how do I find the horse I want to pick? After looking at the map in the back of your catalog, you will have access to the area where the horses are penned up. Each pen will have a number on it, in numerical order, along with a numbered sticker on each horse's rump which corresponds to that horse's lot number in the Sales Catalog. Cash, Visa, MC & Discover. Sorry, we no longer except checks. Are the horse registration papers available the day of the sale? Yes, once you have paid in full for the horse(s) you have drawn, their registration papers will be made available to you the day of the sale. What kind of training do the yearlings receive before the sale? In preparation for the sale, great care is taken to show each yearling how to greet their handler, lead, stand tied, pick up their feet and load into a trailer. Elements of a much larger training program Tom Dorrance helped us set up years ago. Even with this foundation in place, like any young horses, one should always use good "horse sense" when working with them. Does a halter come with my horse? No, most people bring halters with them, but you can purchase halters at the sale. Is there someone available to help load my horse? Yes, we will load your horse for you. What if I cannot take my horse with me the day of the sale? If at all possible, we suggest you take your horse home within a day of purchase so that it may get settled in. You may, however, leave your horse for 48 hours after purchase with no extra charge. If longer, board will be charged at the rate of $5.00 per day. This will include alfalfa hay and a grain supplement. After 30 days from purchase, board charges will be renegotiated. Board charges do not apply to foals staying on mares.